The beautiful thing about mosaics is the ability they have to create a picture with a variety of substances. Mosaics can be made from rock, glass, ceramic, tile, brick and various other substances. A mosaic’s design is only limited by the imagination being used to create it. Mosaics can be pictures, swirls, waves, or geometrical patterns. They can incorporate various colors, shapes and textures to form intricate patterns of design. It is really up to the designer as to what type of mosaic is used. The amount of space and location should be taken into account. Mosaics can liven up any room or even accessory. They can be used on kitchen backsplashes, on bathroom floors or showers, and even on walls as artwork. Mosaics can be used to decorate tabletops, lamps, vases, wine bottles, bowls, plates, and other sundry of items. Another popular use is to create mosaics on kitchen or bathroom countertops and they are also being created on cupboard doors. Spirals and swirls can be used to instill calmness in an area and can provide focal points in rooms. Swirls and spirals are often depicted as the sky, the ocean or floral images. They create serendipitous scenes bringing serenity to the environment in which they are placed. Geometric patterns are easy to achieve and create uniformity. They can be small and subtle to enhance a specific area, or can be larger to draw attention and create a dramatic view. Various textures can bring even more visual appeal to geometric configurations. Images can also be created using color and shapes. Fish, birds, flowers and trees are just a few of the popular images that can be utilized. These pictures can be created using templates. The templates can either come from photographs or images out of magazines and off of the internet. Mosaic design is not reserved for indoor use. They are also very beautiful accents to use outdoors. They can be used on outdoor patio floors, outdoor walkways, stepping stones, and swimming pool areas. They can also be used to create decorative rocks for gardens. 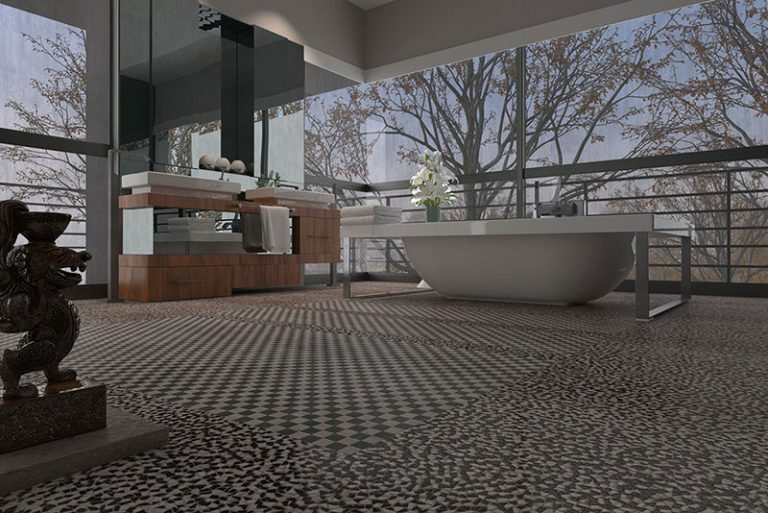 Whether the mosaic embodies an earthy feel or something vibrant and colorful it can be the perfect accent for any area.